But there are a few things you need to know when keeping chickens and producing eggs. Laws regarding keeping poultry are determined by each state or territory. In some cases, LGAs have created bylaws that amend the state laws. Contact your LGA for the most accurate and up-to-date regulations. Avoid buying roosters if living in a suburban area, as many local government authorities (LGA) prohibit them because of their crowing. When first obtaining chickens, it is best to purchase vaccinated birds from a reliable commercial source. Do not get birds from a variety of sources as this can increase the risk of introducing pest and diseases. A good starter flock to provide eggs for a household would consist of four to five 16-24 week old birds (described as point-of-lay pullets). Before constructing any form of housing for your chickens, be sure to get approval from your LGA. The LGA may regulate the building position and the number of birds you keep. Thoroughly clean old housing as it could contain mites, fleas or ticks. Wooden structures may need to be removed and the soil surrounding old housing should be tested to ensure it is free from chemicals (see the 'Preventing organochlorines in eggs' section below). It is important to have a fox-proof coop which is still easily accessible and adequately ventilated. The coop should be fully enclosed and the chickens locked away every night. Locate the chicken house facing east so that the back is towards the strong westerly, rain-bearing winter winds. A belt of vegetation to the east will provide protection against the wind but ensure it still lets in the morning sun. Cover the floor with sawdust (at least 8cm) so that it mixes with the poultry droppings to form ‘deep litter’. After nine months, the litter can be removed, composted and used in the garden. Check with your LGA as many have banned the use and storage of chicken litter unless composted, as it provides a breeding medium for stable flies. The chicken house should contain a perch (no more than 60cm high) for roosting and nesting boxes which can be accessed from the outside. Nesting boxes provide a safe comfortable area for hens to lay their eggs and allow ease of collection. The chicken run should be bordered by 1.8m high chicken mesh and enclosed to discourage foxes from killing the chickens and wild birds from eating the chicken feed and possibly introducing diseases. To deter foxes from digging under the fence, dig the netting into the soil to a depth of 50cm or continue the netting outwards at the base of the fence. By law, chickens must be provided with appropriate food, water and protection. The quality of food and water is also important as the wrong balance of nutrients and quantities of feed can lead to poor egg production and bird health. Commercial layer pellets provide the best, balanced source of nutrients for chickens. It is common practice to feed food scraps to chickens, and this seldom causes a problem. However, certain scraps have been known to causes problems in chickens, such as chocolate, onions and garlic. Note: If you have ruminants such as cattle, sheep and goats on your holding, ensure that you do not feed chicken feed and litter to them. This is a legal requirement to ensure that Australia can continue to demonstrate freedom from bovine spongiform encephalitis (BSE – mad cow disease). Read more on the restricted animal materials webpage. Like all animals, chickens can experience health problems. Always call a vet to assist you with diagnosing and treating chicken health issues. Poultry owners should monitor the health of their birds daily. A healthy bird should be alert, active, eat often, have clean eyes and nostrils and its breathing should be silent and unnoticeable. Sick birds may have drooping wings and tail, discharge from the nostrils and eyes, weakness or paralysis of one or both legs or wings, be lethargic or experience a loss of appetite. If you see unusual illness or behaviour or unexpected deaths in your poultry, call your vet immediately or the Emergency Animal Disease hotline on 1800 675 888. Observing the flock every day, and learning what is normal for your birds, can help you identify when a bird is sick. Below is a list of some of the health issues that may occur in backyard flocks. Egg-bound hens: caused when an egg matures inside the bird, but is not laid. Euthanasia is the most appropriate action. Egg peritonitis: this is when an egg ruptures inside the bird. Affected birds become depressed, cease eating and usually die. The most common cause of egg peritonitis is perches set too high. Lice: these are small parasites which can cause severe irritation and stress. Birds often stop laying. Treat with a registered poultry dust. Stick fast fleas: these appear as small, shiny black dots; move very little, on the combs, wattles and around the eyes. Larvae need deep soil to complete their development so an impervious floor under the roosting area can assist control. Treat individual birds with a registered treatment. Cats and dogs can also be affected. Mites and ticks: Blood-sucking parasites which can cause severe irritation, loss of blood and body weight. These pests also lead to a decrease in egg production and death. Mites and ticks can spend considerable time off the host, therefore it is essential to remove and destroy rubbish in the coop so that it can be properly cleaned and sprayed with an insecticide registered for the purpose. 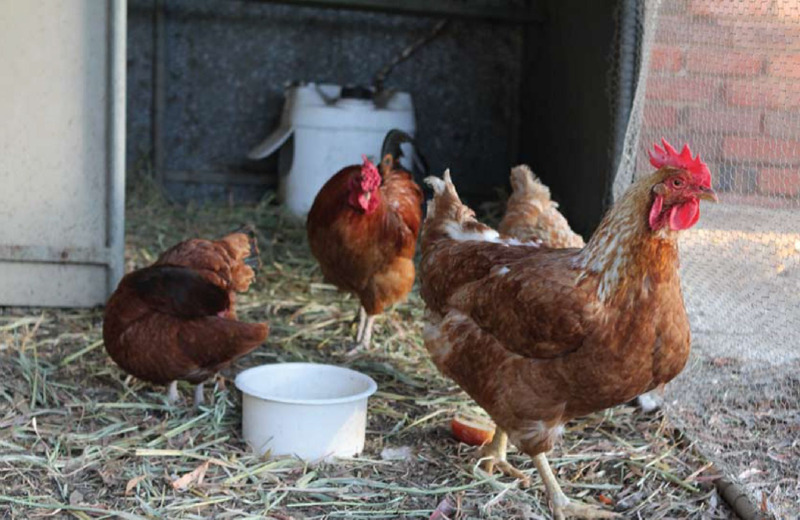 The most common mites in WA poultry are the scaly leg mite and the red mite. There are a wide variety of viral diseases that can affect poultry. Some viral diseases can be included in the vaccination regime when you buy fully vaccinated point-of-lay pullets. Vaccination of chickens is a specialised task and should be discussed with your hatchery, pullet supplier or veterinarian. 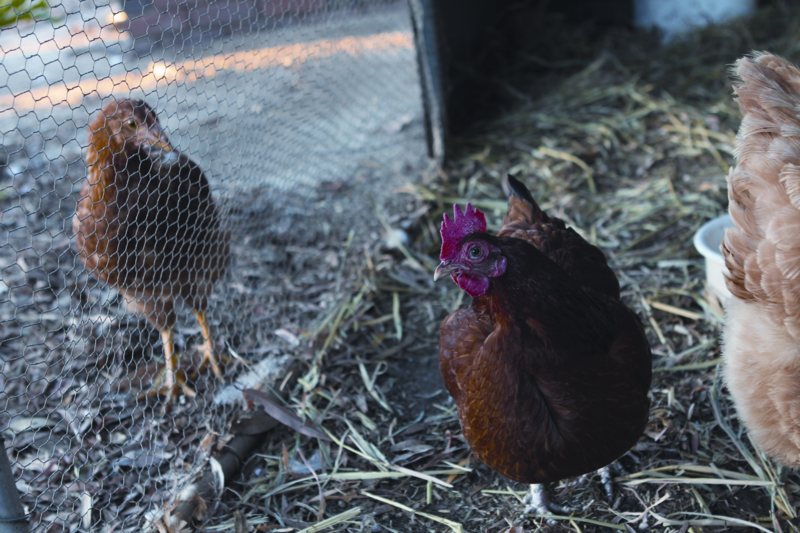 Two diseases that are not present in Australia that poultry owners should be vigilant for are high pathogenic avian influenza and Newcastle disease. These diseases could have devastating impacts on the poultry industry in Australia. Avian influenza is a common viral infection of wild waterbirds throughout the world, including Australia. The virus is almost always harmless to these waterbirds, but can mutate to become highly pathogenic if it comes into contact with non-waterbird species, particularly poultry. Depending on the strain, the virus causes a wide range of signs in poultry including decreased egg production, depression, diarrhoea, respiratory signs and death. Some infected birds may not show any signs of disease. Read more on avian influenza. Newcastle disease can cause a range of signs from a mild respiratory disease to a very severe depression, drop in egg production, increased respiration and profuse diarrhoea. In WA vaccination of commercial flocks (over 1000 birds and not including meat chickens) is compulsory. It is optional for smaller flocks. Read more on Newcastle disease. The earlier the disease is detected, the less it will spread and the faster it can be eradicated. Early reporting is essential to protect the poultry industry. Marek’s disease causes tumours, paralysis and death in young birds. There is a vaccine available, but it must be administered in the first 24 hours of life to be effective. Infectious laryngotracheitis and infectious bronchitis – These cause respiratory diseases and are evident by reduced egg production, coughing, mouth breathing and possibly death. A vaccine is available. Egg drop syndrome and avian encephalomyelitis – Both of these diseases can be transmitted through the egg and spread from bird to bird. They cause very little illness, but egg production is severely affected for several weeks. Avian encephalomyelitis may cause a severe brain disease and death in young chickens. Fowl pox – Spread by mosquitoes, fowl pox results in birds developing wart-like growths on the face and vent. Some strains of pox are very severe and result in lesions in the oesophagus and often death. Other strains are milder and resolve naturally. Fowl cholera – This causes reduced egg production and increased mortality. Birds appear depressed and lose appetite for a few days prior to death. Antibiotics can be used to treat this disease. Mycoplasmosis – A common disease in poultry kept in the metropolitan area, it causes reduced egg production and a mild respiratory disease. It is difficult to control in mixed age ﬂocks. Chicken houses and other old structures built before 1984 could have been treated with organochlorines (e.g. dieldrin and DDT) to control termites. These chemicals can be harmful to humans if ingested in high concentrations. As birds eat soil to help digest their food, any organochlorines still left in the soil can contaminate their meat and eggs. If you are unsure about the status of your soil, testing can be carried out by private analytical laboratories. Read more on the chickens and OCs webpage. The production and sale of food in Western Australia is governed by the Food Act 2008, Food Regulations 2009 and the Australia New Zealand Food Standards Code. Food businesses must comply with the requirements of this legislation, with monitoring and enforcement being undertaken predominantly by the Department of Health and local governments. Contact the WA Department of Health (Food Unit) for more information.